Columbus, OH — Dean W. Beachy 62, of Millersburg, OH, died Thursday, January 24, 2019, in State College, Pa. a victim of a random shooting. His son Steven also died as a result of the shooting. Born January 16, 1957, he was a son of the late Albert J. and Emma Jean (Beachy) Beachy. 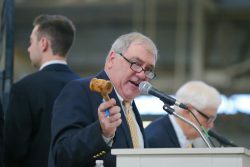 Dean was a renowned auctioneer and a member of Walnut Creek Mennonite Church. Dean W. Beachy 62, of Millersburg, OH, died Thursday, January 24. Dean Gillette Photo. He is survived by his wife, the former Linda Meader, whom he married September 21, 1991. Also surviving are his children Robert Joseph Beachy, Benjamin Dean Beachy, David Albert Beachy, (Steven Lee Beachy, also a victim of the shooting) all from Walnut Creek, 2 sisters Wilma Mae (Daniel) Yoder of Medina, N.Y., Diane Sue Beachy of Walnut Creek and a sister-in-law Esther Beachy of Winesburg. In addition to his parents, he was preceded in death by a brother, Dale Lee Beachy. Funeral services will be held Tuesday, January 29, 2019, at 11:00 AM at the Mt. Hope Event Center in Mt. Hope with Pastor Don Hamsher officiating. A private burial will be held prior to services. Friends may call at the event center Sunday from 5 to 8 PM and Monday from 2 to 4 and 6 to 8 PM. Smith-Varns Funeral Home in Sugarcreek is handling the arrangements. To share a memory, please visit the funeral home’s web site. In lieu of flowers, contributions can be made to Walnut Creek Mennonite Missions Program (330-852-2560).